Construction Machinery Four-Stage Emissions Technology Forum Successfully Held in BICES 2017 ! On the grand occasion of the 14th Beijing International Construction Machinery Exhibition & Seminar, BICES’organizer of China Construction Machinery Association (hereinafter called CCMA) held "Construction Machinery Four-Stage Emissions Technology Forum "on Sep 21during BICES 2017.Mr. Su Zimeng, Vice Chairman & Secretary General of CCMA, Mr.Wang Jinxing,Deputy Secretary General of CCMA, Mr.Liu Shunli from Jinnan Auto Testing Center (hereinafter called JNATC) attended in this forum. CCMA also specially invited Mr.Wang Bin, Manager of Asset Management Department of Beijing Municipal Road and Bridge Group Co., Ltd.and other leaders of municipal groups, conservation groups, building materials group, high-strength concrete company belong to the Beijing Municipal Road and Bridge Group Co., Ltd. 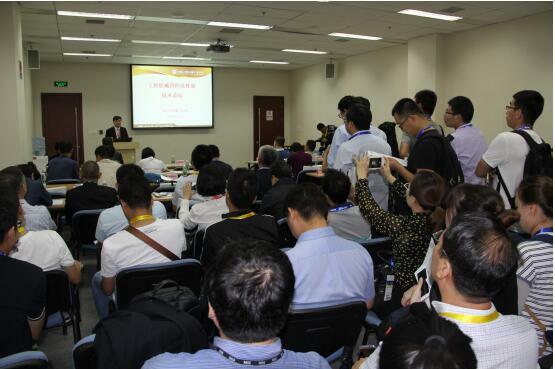 Meanwhile, more than 90 representatives from construction machinery and engine enterprises also attended the forum. Ms.Song Jinyun from Standard Regulations Department of CCMA hosted this forum. Firstly, Mr.Su Zimeng, Vice Chairman & Secretary General of CCMA delivered a welcome address on the forum. 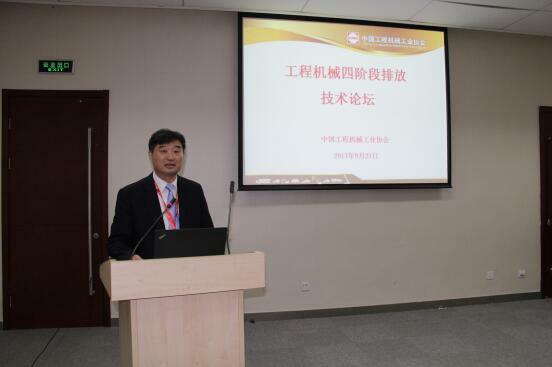 Mr. Su introduced the situation about construction machinery industrial enterprises to implement the new emission standards and fully execute the work from the angles of national policy and industry development strategy, as well as the initial resultsthe achieved by CCMA at promoting a comprehensive upgrade standards. He stressed that the green environmental protection work is not only a important measure for the transformation and upgrading of the construction machinery industry and narrowing the gap with the developed countries, but also a social responsibility for contemporary construction machinery industry .We hope that through the BICES 2017 to push out a number of new technologies and new products meeting with the national emission standards and to discuss or propose new pathways and new measures of construction machinery technology upgrade to promote construction machinery green environmental protection industry development. Mr.Wang Bin made a keynote speech on the theme of " with active participation and change to meet the challenge of higher environmental standards". Mr.Liu Shunli as professor aslo detailly introduced the draft situation of four-stage emission standards of non-road mobile machinery at this forum. The forum also specially invited Mr.Huang Zhongliang,Deputy Director of Platform Technology Institute of General Research Institute,Guangxi Liugong Machinery Co., Ltd, Mr.Feng Xiaolin, Products Manager of Kohler (China) Investment Co., Ltd, Mr.Zu Li Xiao Yan, General Manager of Kubota Construction Machinery (Shanghai) Co., Ltd.to do a introduction about their four-stange emission products and technology.Three leaders respectively introduced the four-stage emission technology route, the engine emission control strategy, the technical characteristics of the green construction machinery and the four-stage products from different levels and angles, wich providing lots of technical experiances of four-stage emission upgrade and playing a very good role model for fully supporting the national environmental strategy. Finally, Mr. Wang Jinxing introduced the situation about Beijing non-road mobile construction machinery regulations and market demands. 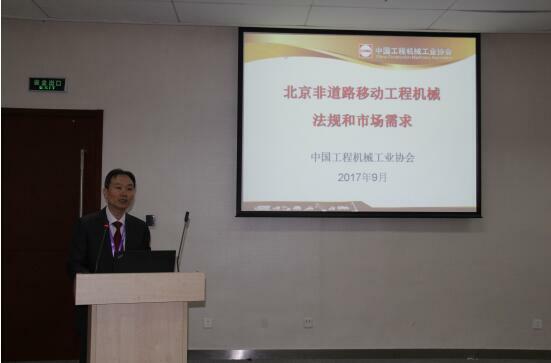 Mr.Wang made the introduction from the relevant laws and regulations, Beijing market situation and BICES 2017 four-stange emssion exhibition area.In particular, BICES 2017 set up "non-road mobile construction machinery four-stage emission equipment exhibition area" at first time, showing produts of construction machinery and engine in line with four-stage emission standards. CCMA hopes to guide the construction machinery industry strictly following with the relevant laws and regulations, to promote non-road mobile construction machinery reaching the emission standards, to bear social responsibility and to do contribution for protect environment.After the forum, Mr.Wang Bin and other guests came to the exhibition site and visited construction machinery exhibitors and their produts with accompaniment of Mr. Wang Jinxing. 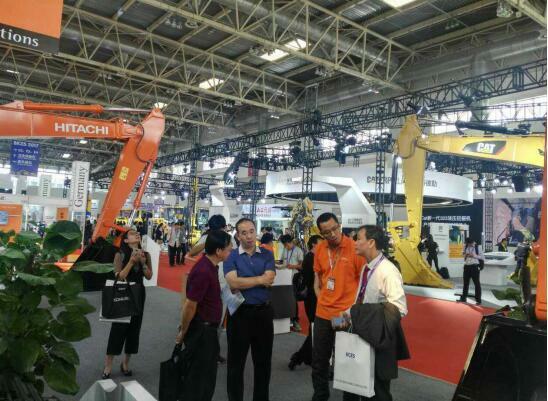 Construction machinery industry enterprises pay high attention to the national and Beijing local policy of four-stage emissions.The forum got a positive response with all seats were occupied, achieved the desired results to effectively promoted the construction machinery industry emissions standards comprehensive upgrade work. This forum suessfully helding under the great help and support from BICES exhibition’s management office of Beijing Asiamachine International Convention & Exhibition Ltd.